In this six-session small group Bible study (guide sold separately), Sacred Marriage, writer and speaker Gary Thomas invites you to see how God can use marriage as a discipline and a motivation to reflect more of the character of Jesus. Everything about your marriage-from the history you and your spouse create, to the love you share, to the forgiveness you both offer and seek by turn-is filled with the capacity to help you grow in Christ's character. Designed for use with the Sacred Marriage Study Guide (sold separately). 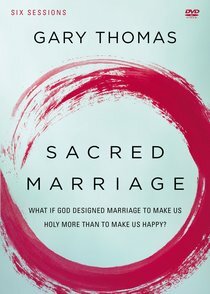 About "Sacred Marriage: What If God Designed Marriage to Make Us Holy More Than to Make Us Happy? (Dvd Study)"